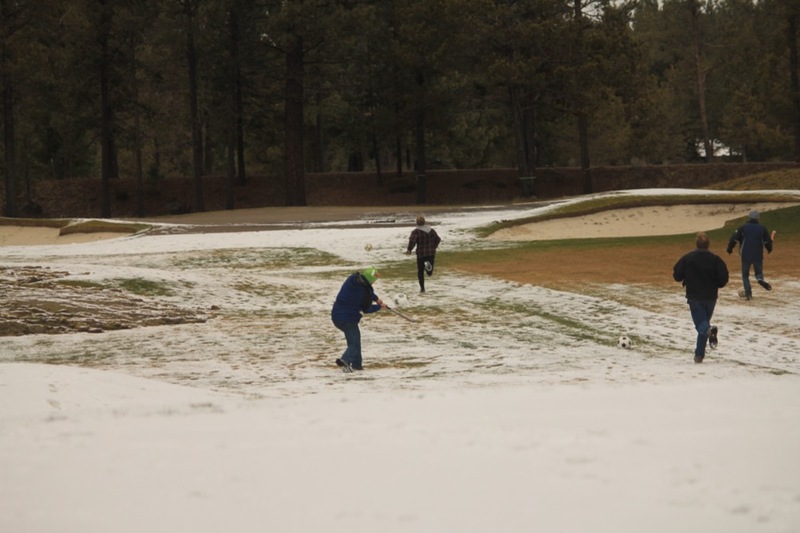 The 2014 Sunriver Frozopen was a dream come true for the hardiest of the Spielman, Sheridan, Price, Mallek, Degear and Hernandez clans. 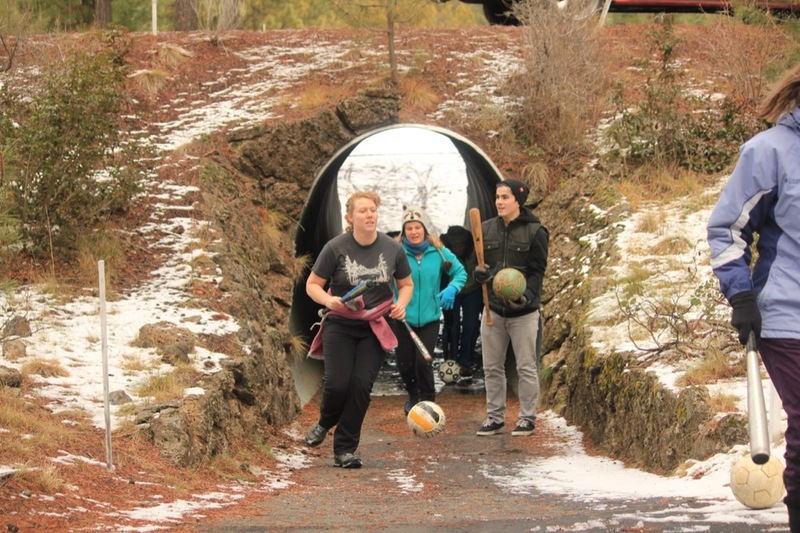 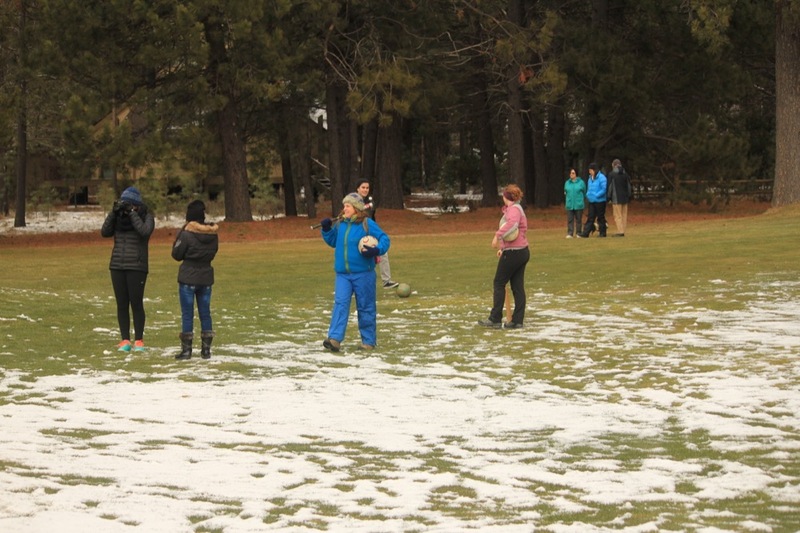 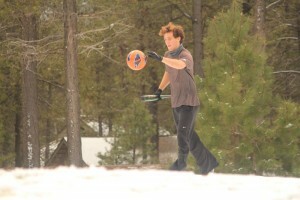 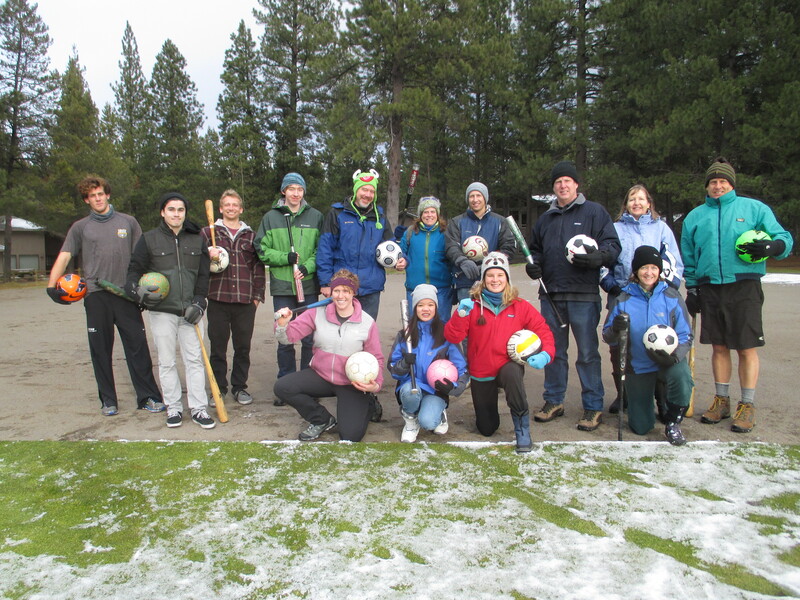 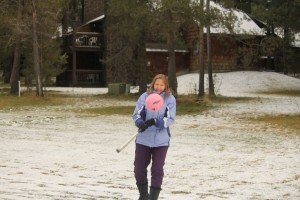 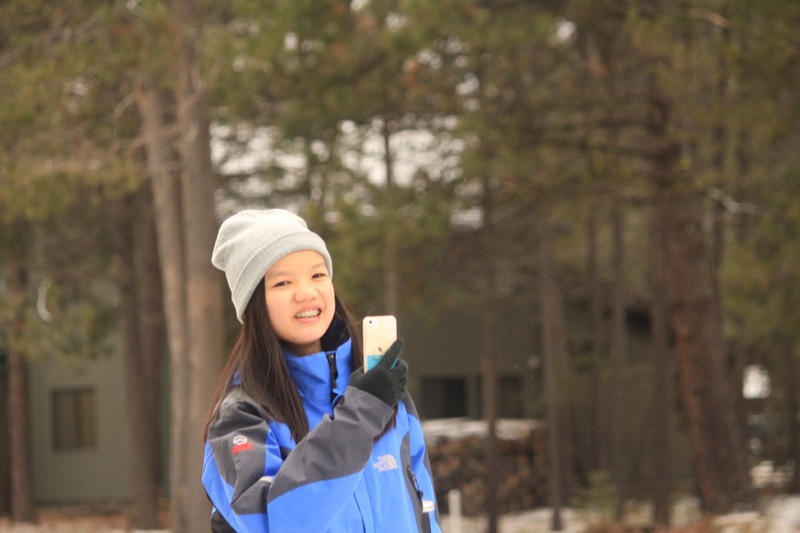 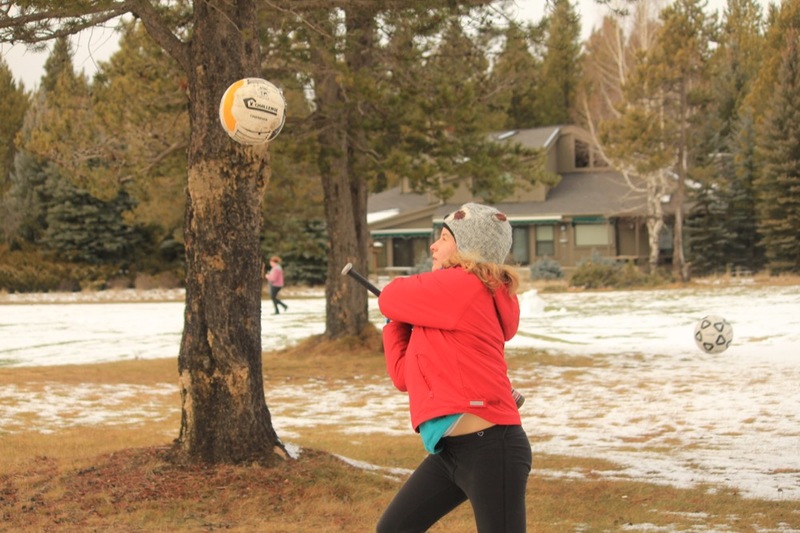 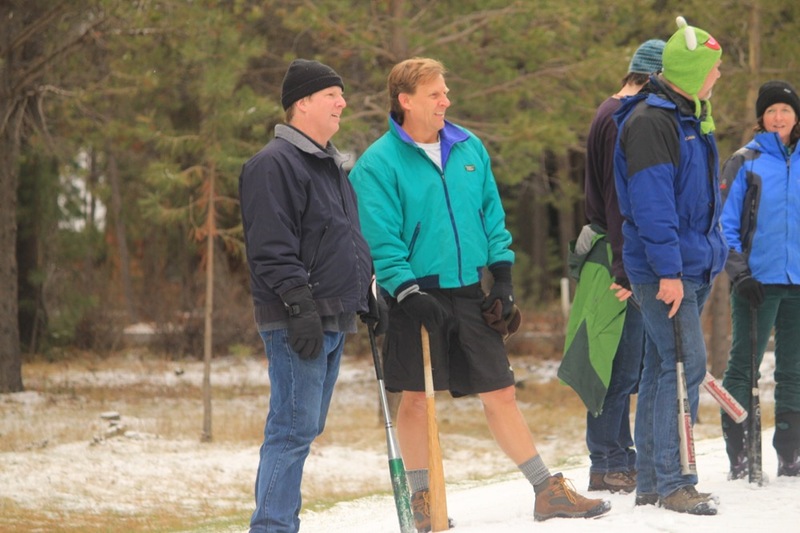 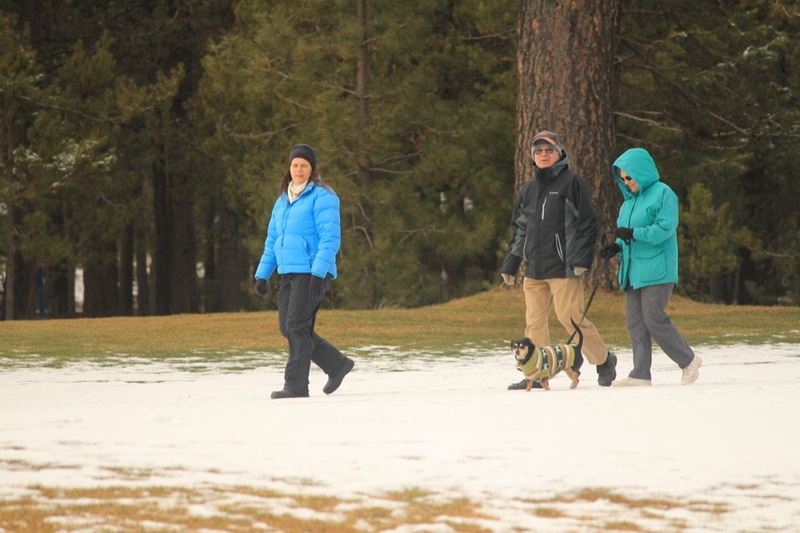 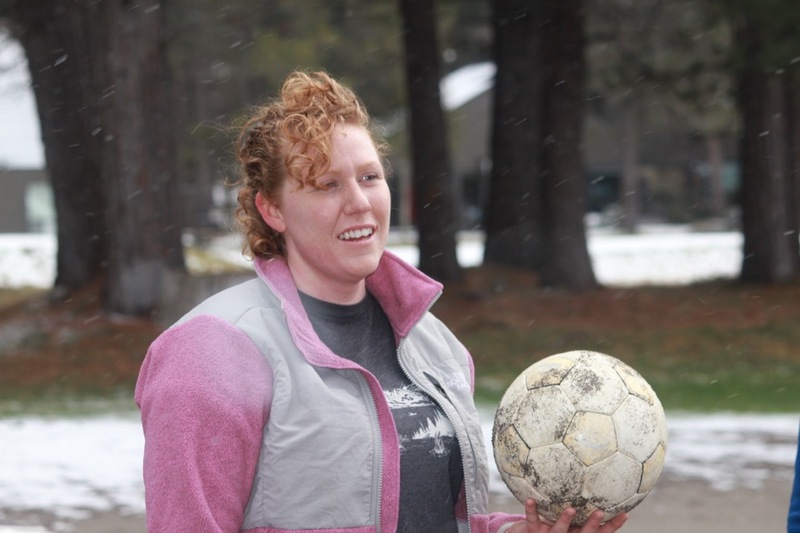 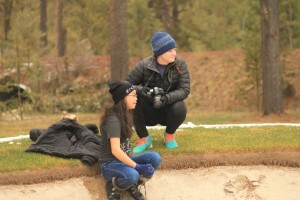 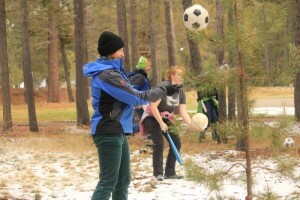 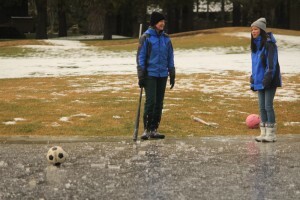 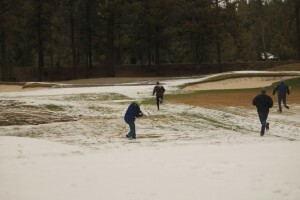 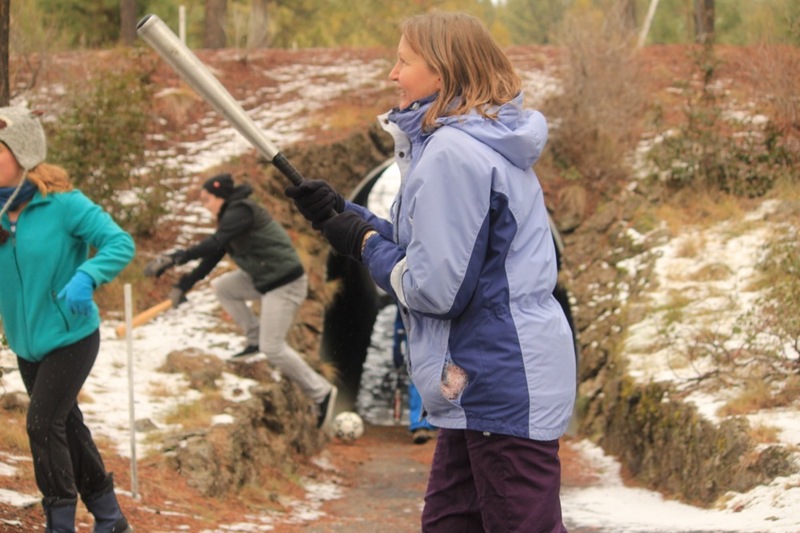 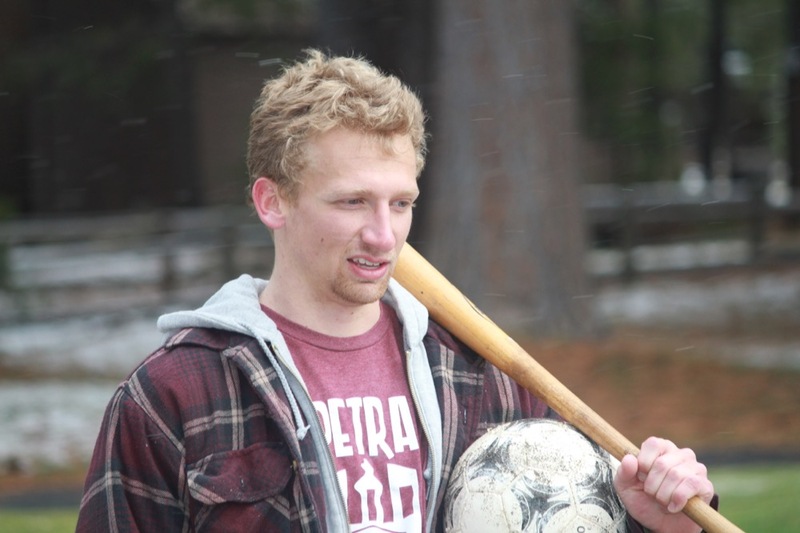 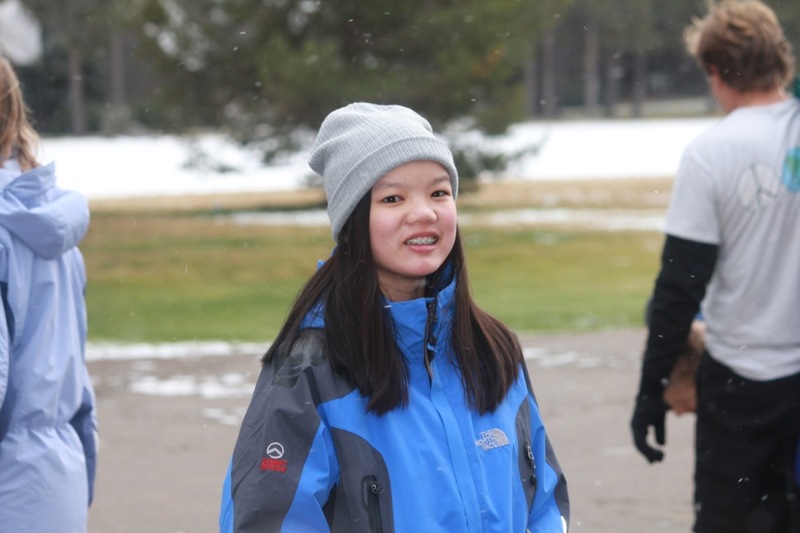 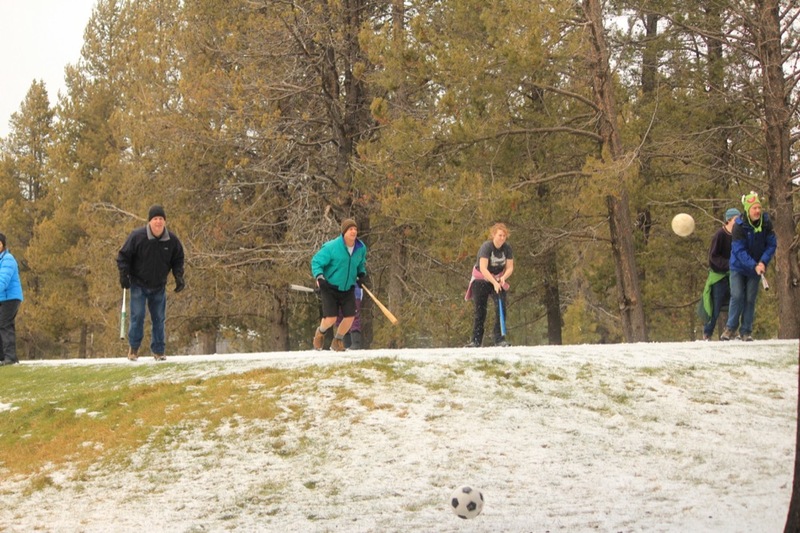 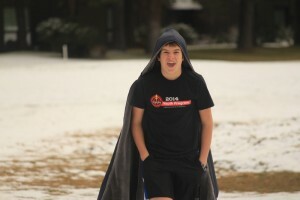 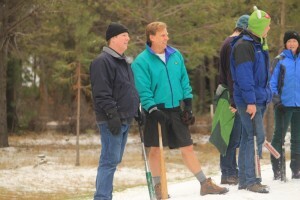 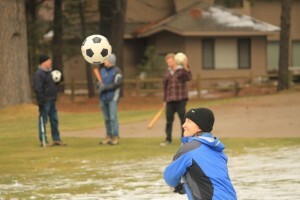 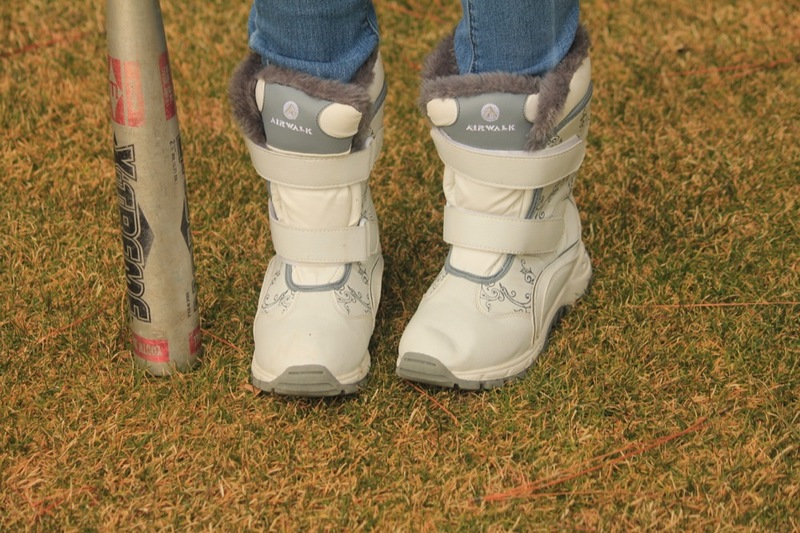 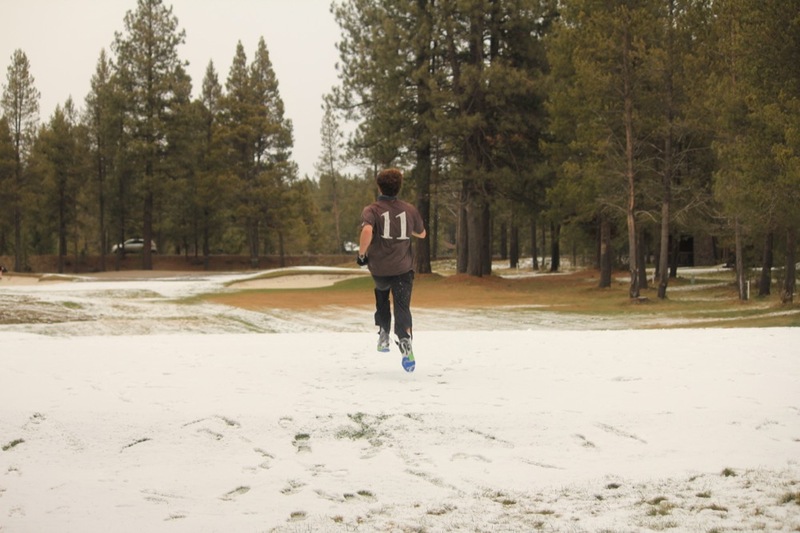 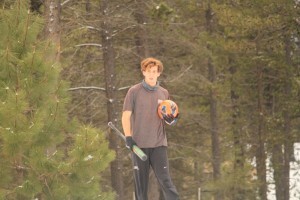 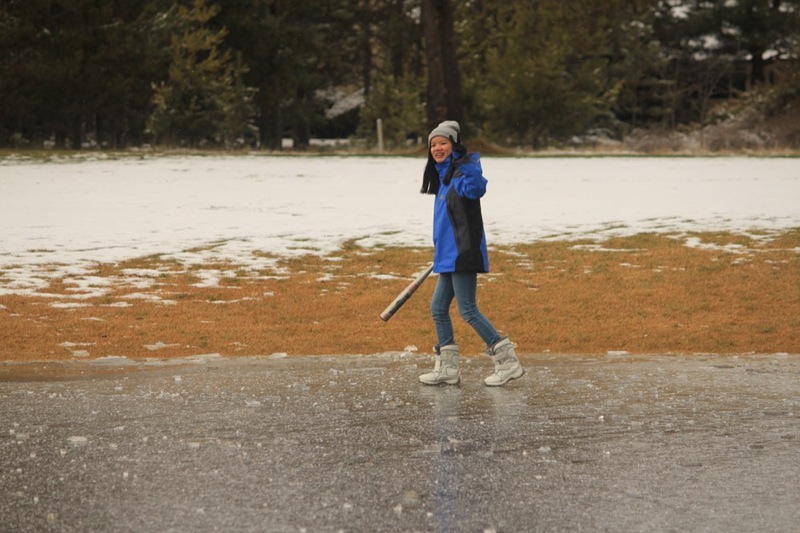 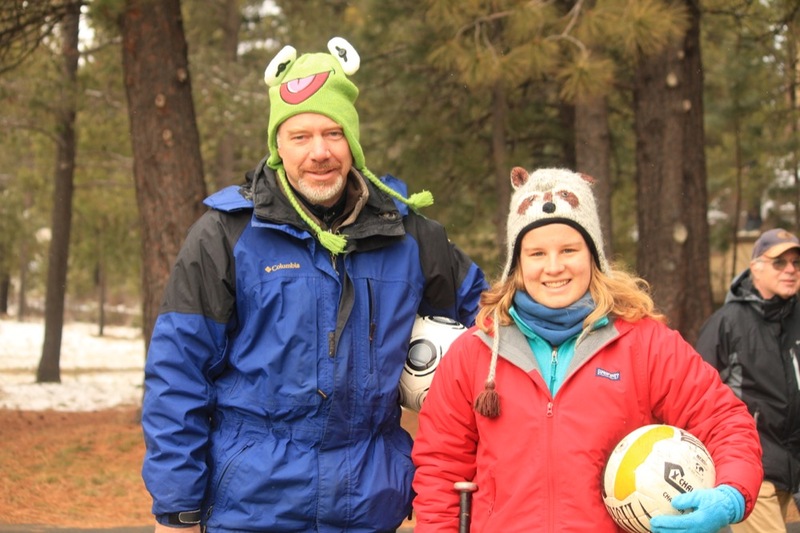 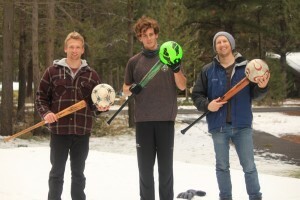 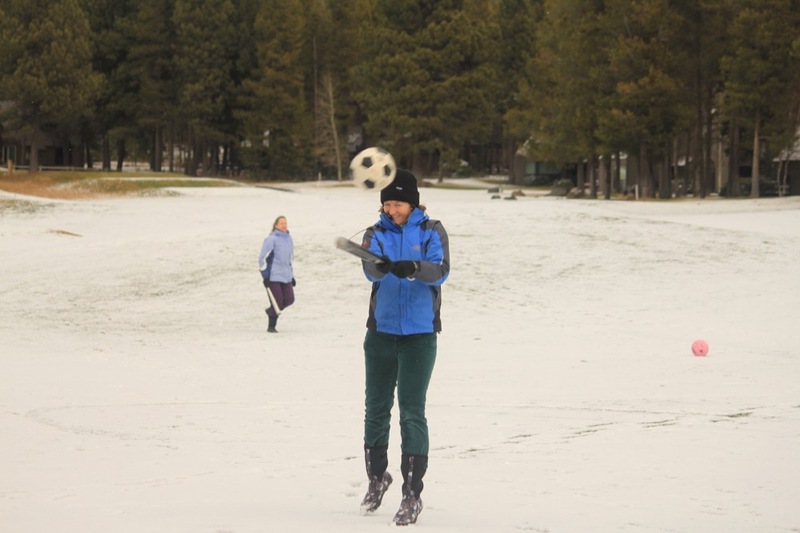 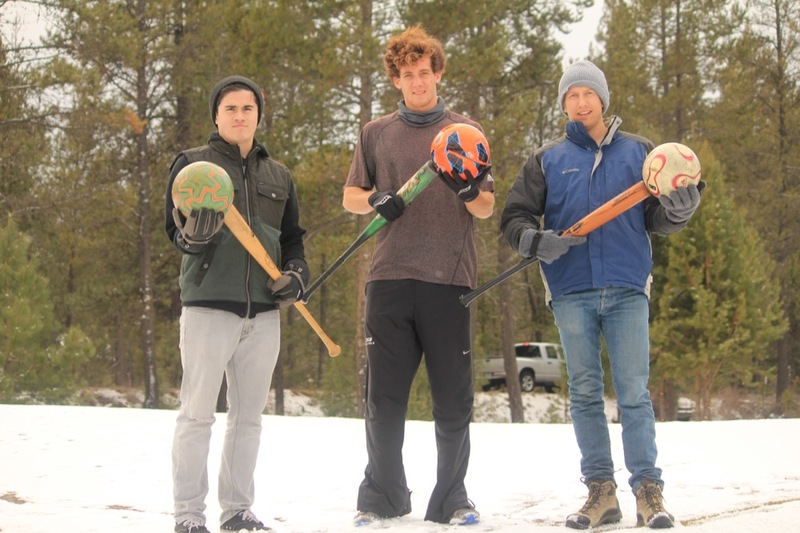 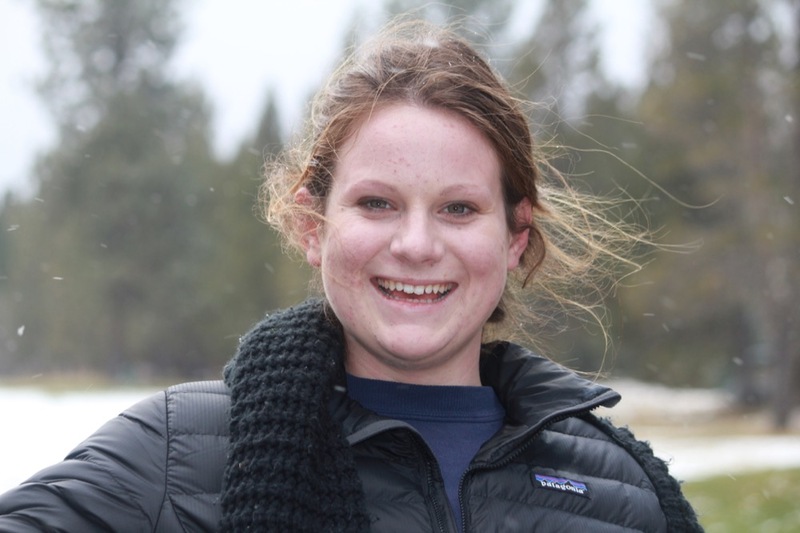 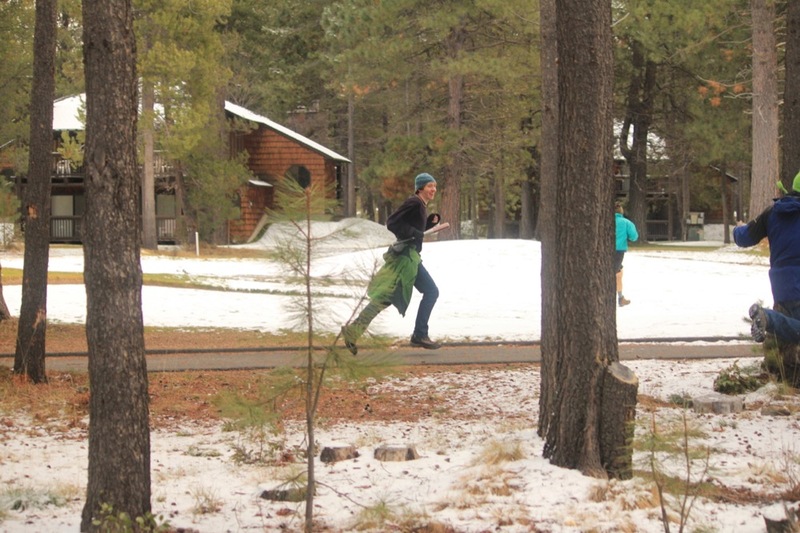 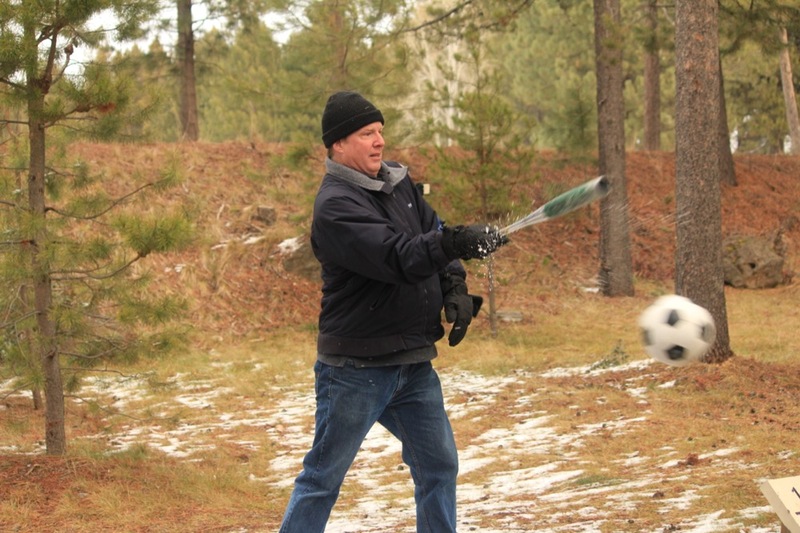 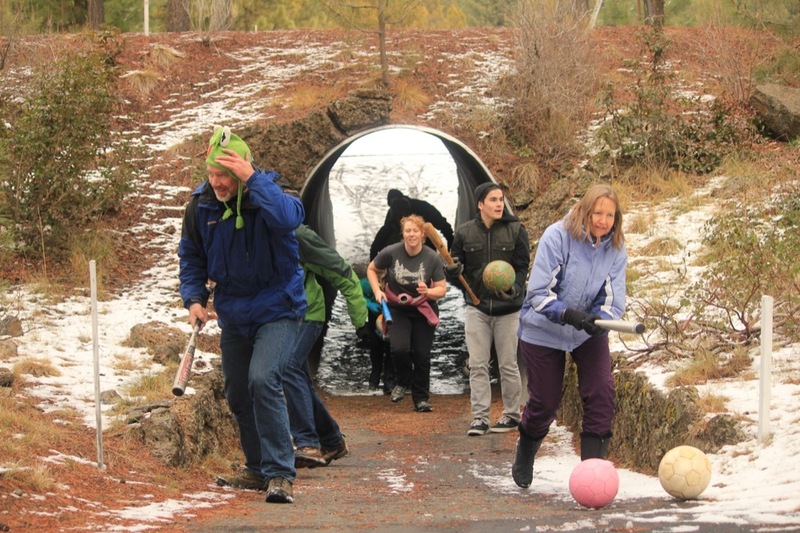 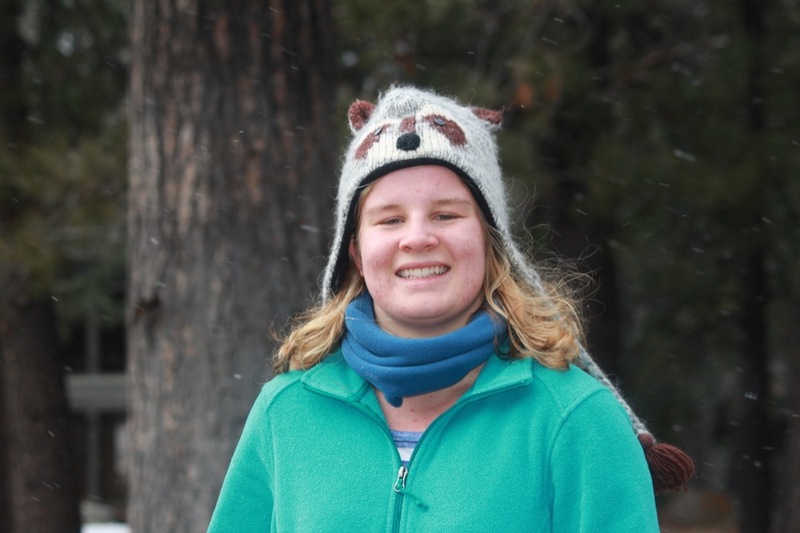 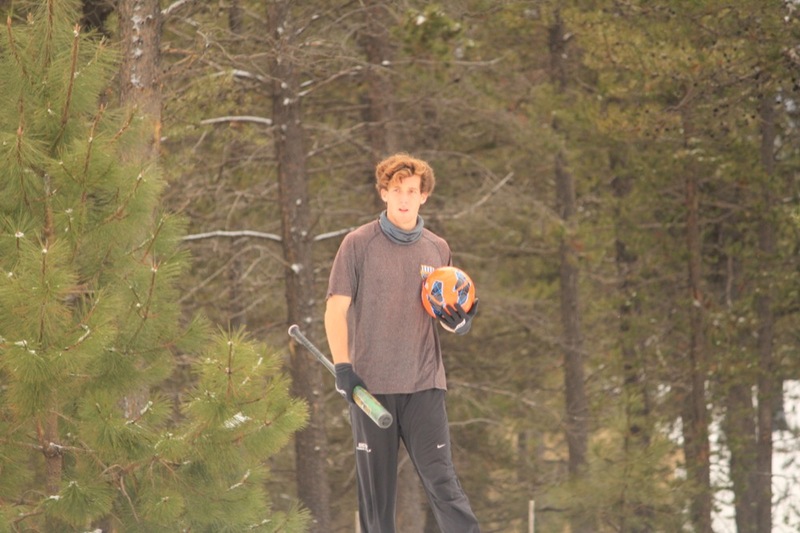 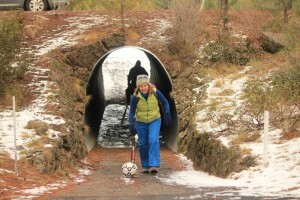 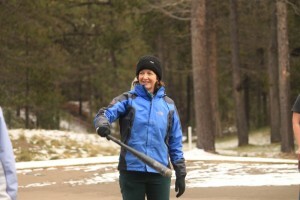 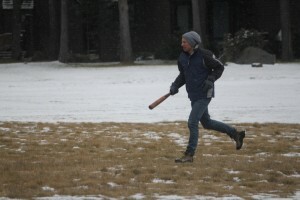 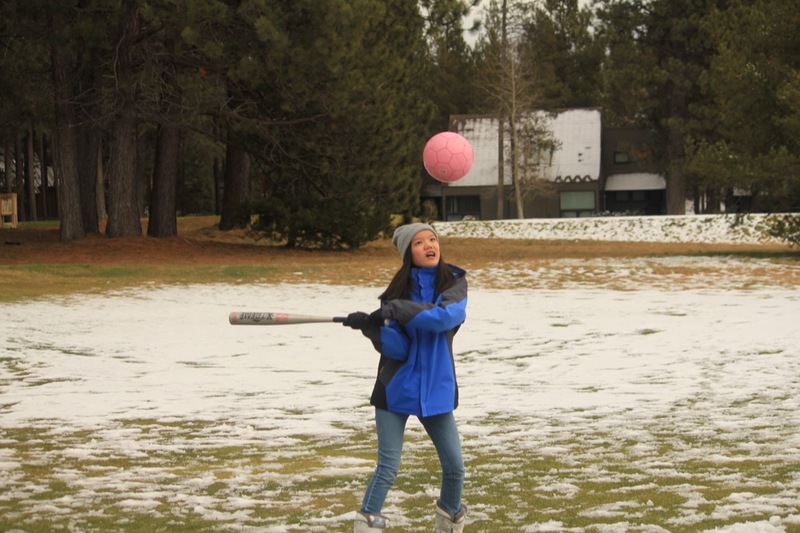 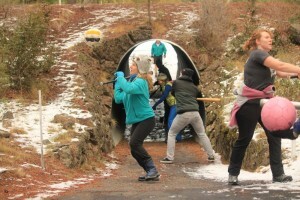 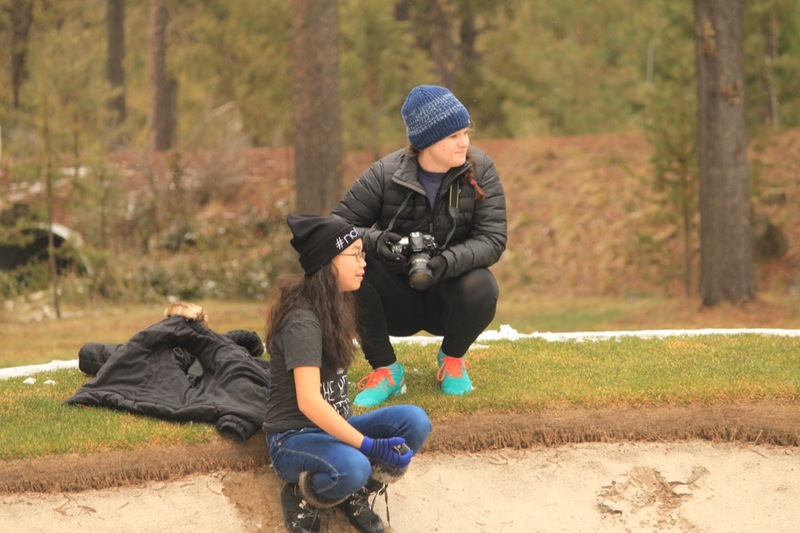 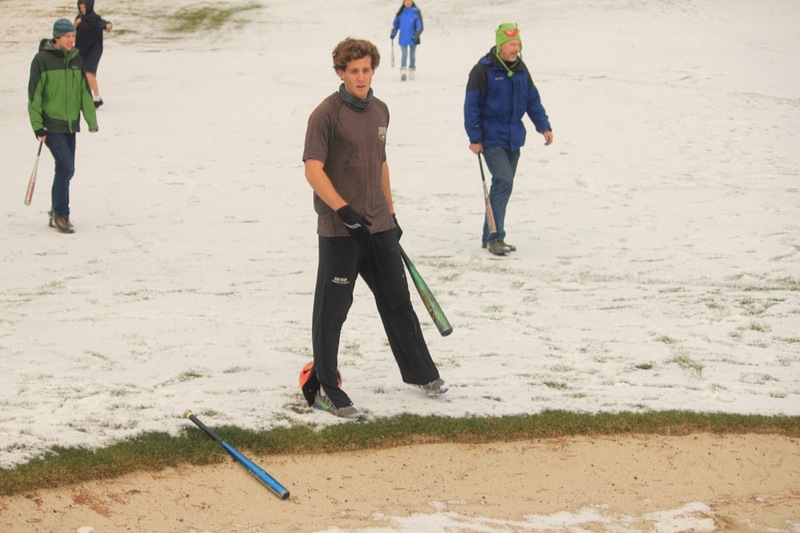 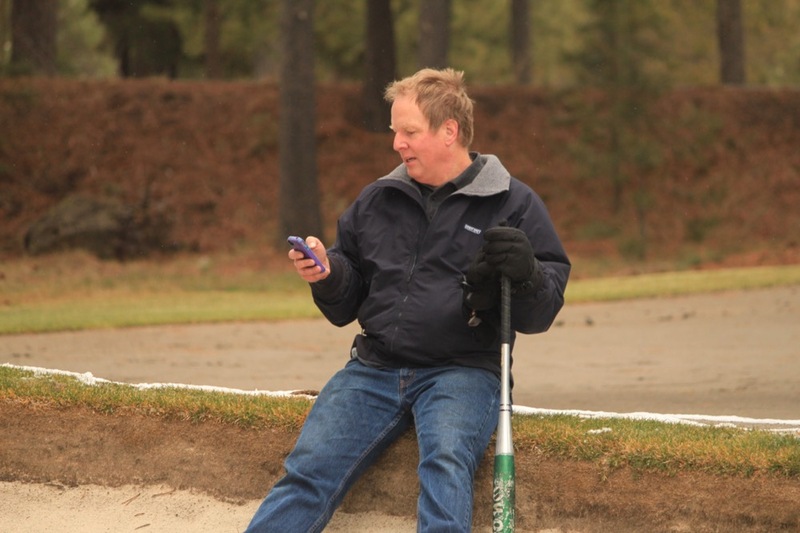 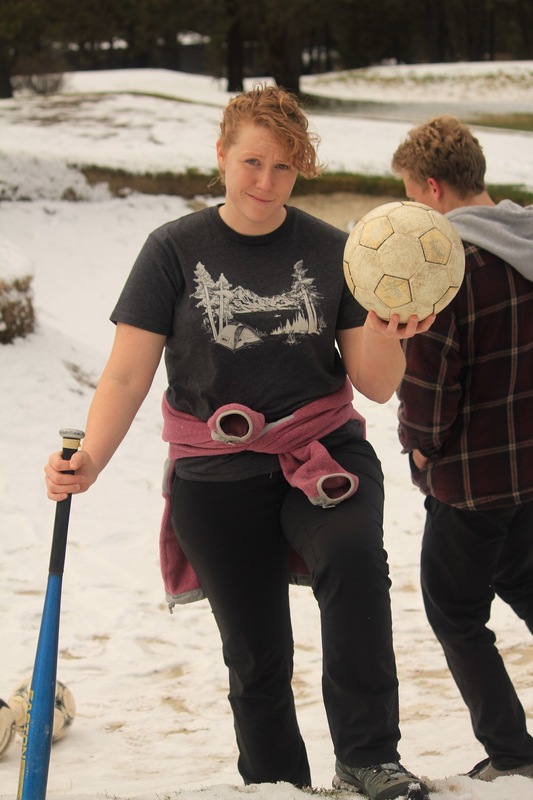 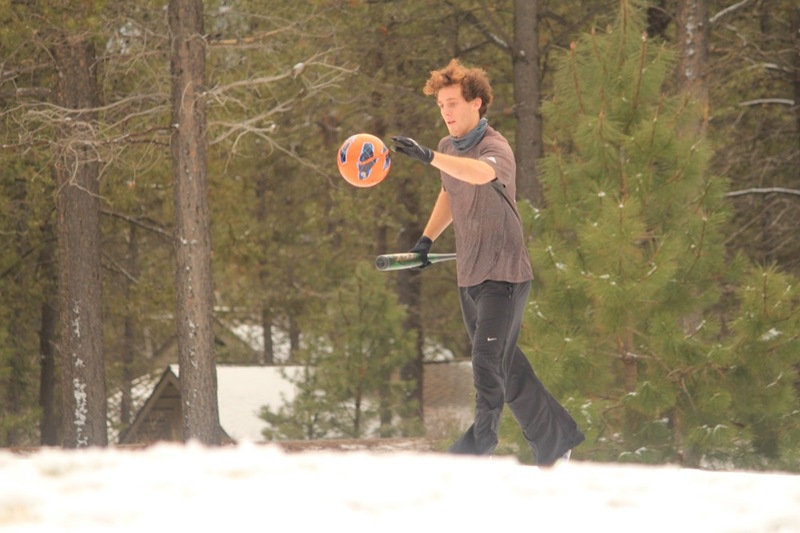 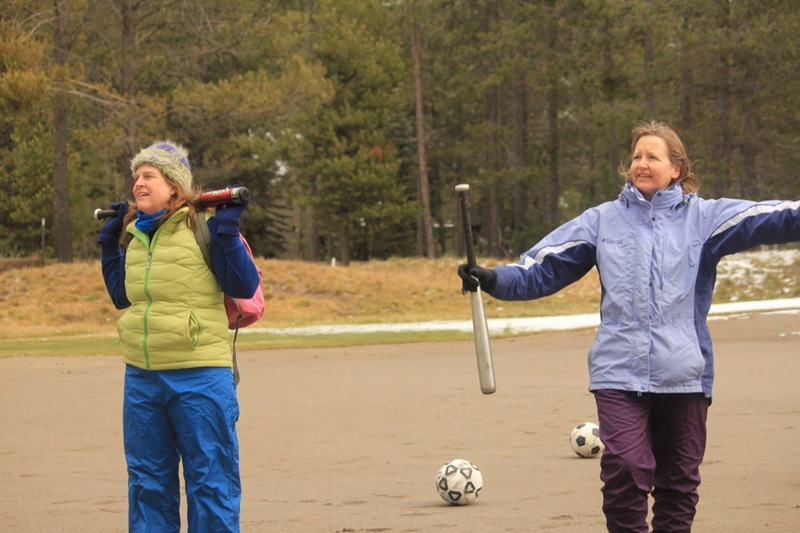 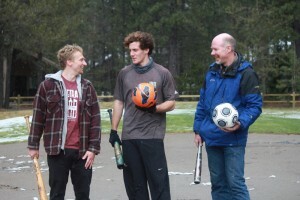 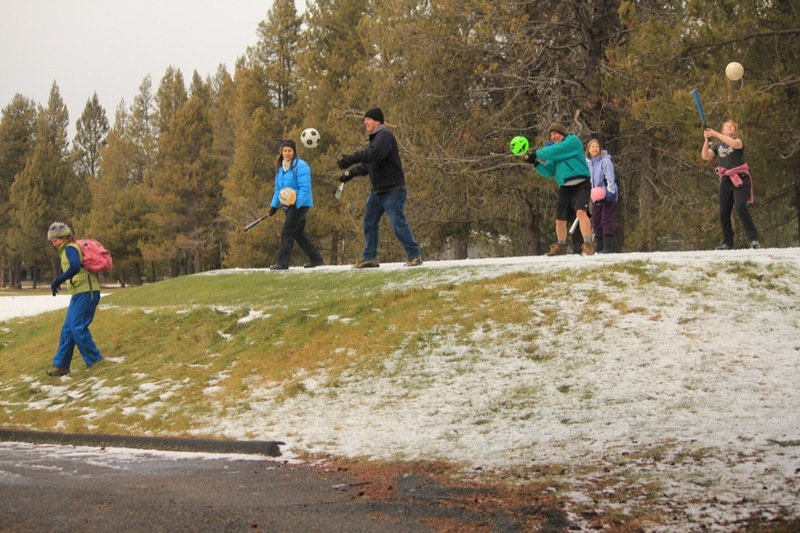 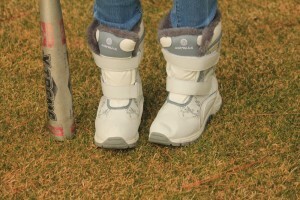 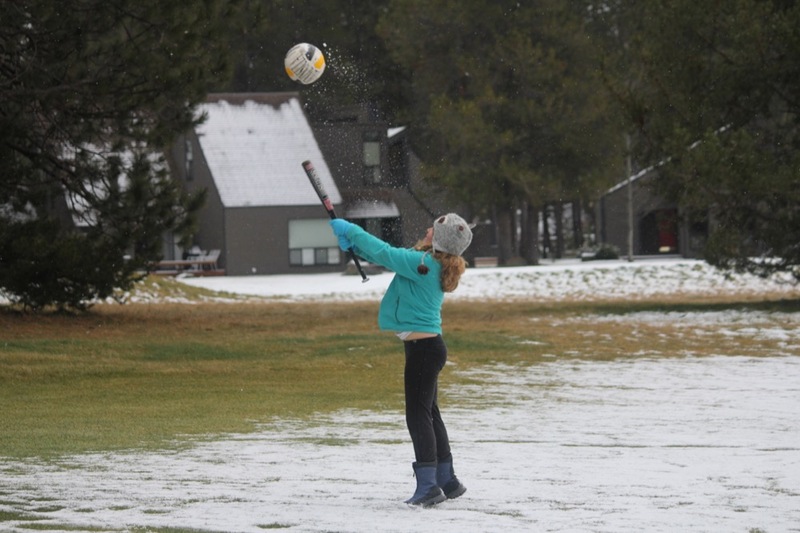 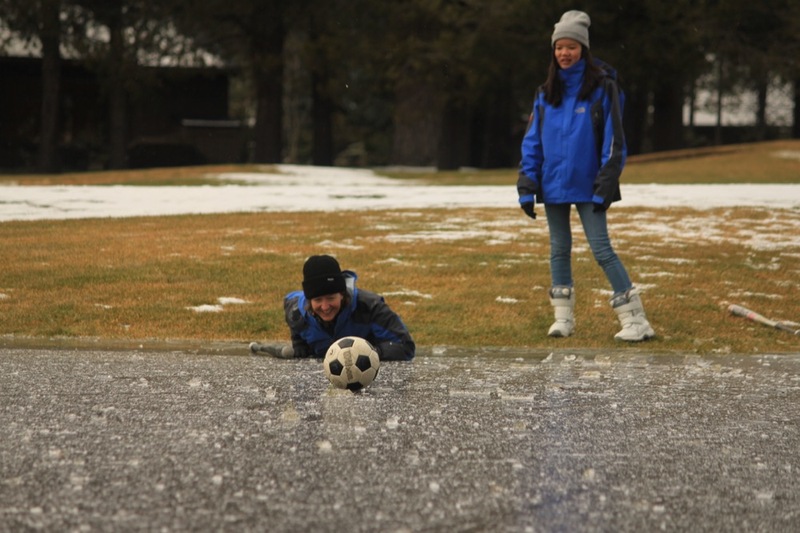 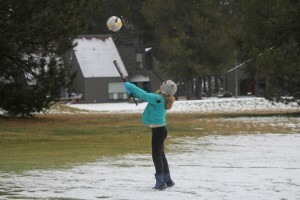 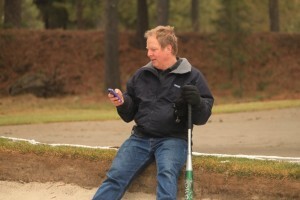 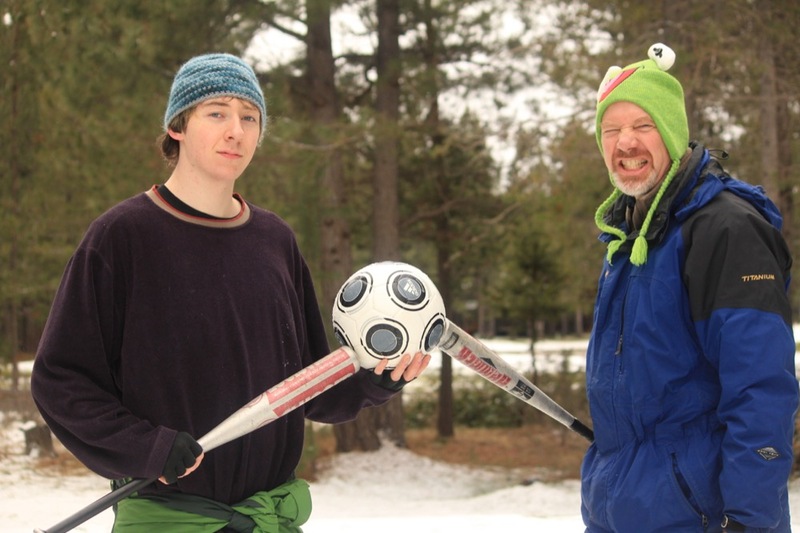 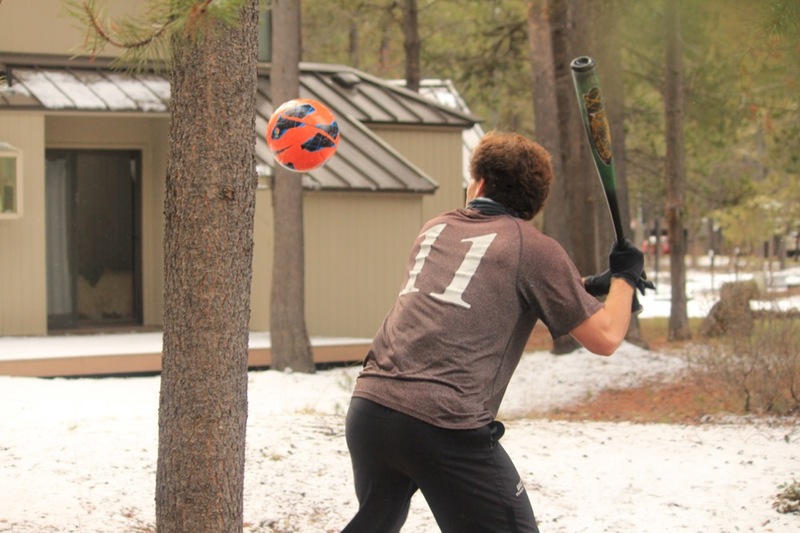 The snow-covered Sunriver golf course provided the perfect venue for an afternoon of slippery athleticism. 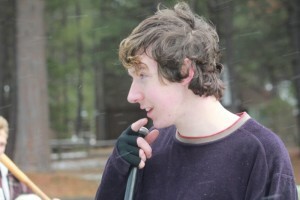 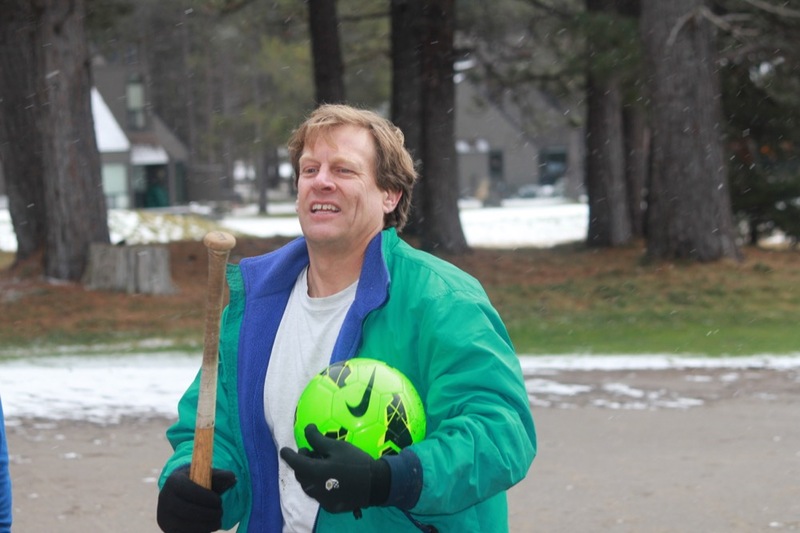 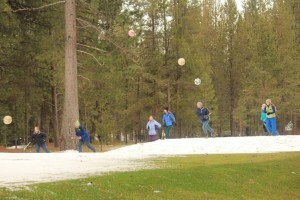 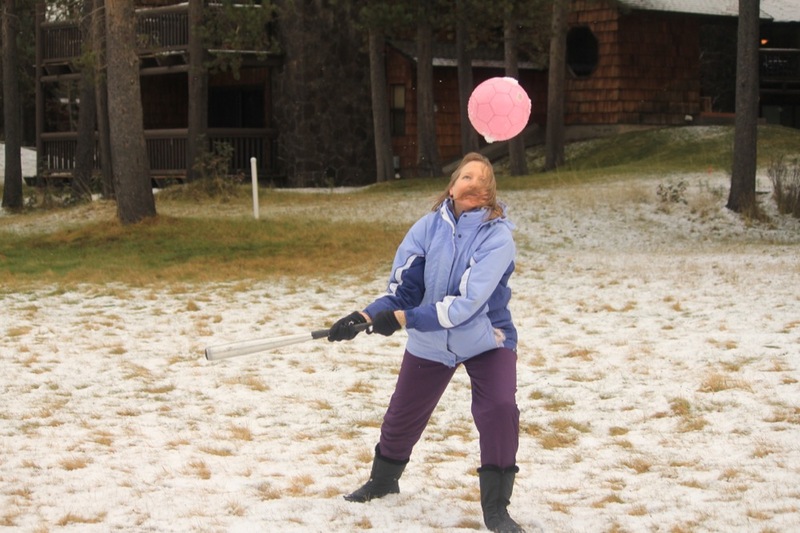 This was the first time that the cross country big ball theater included snow that was both falling and on the ground. 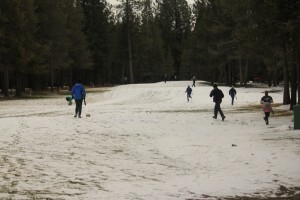 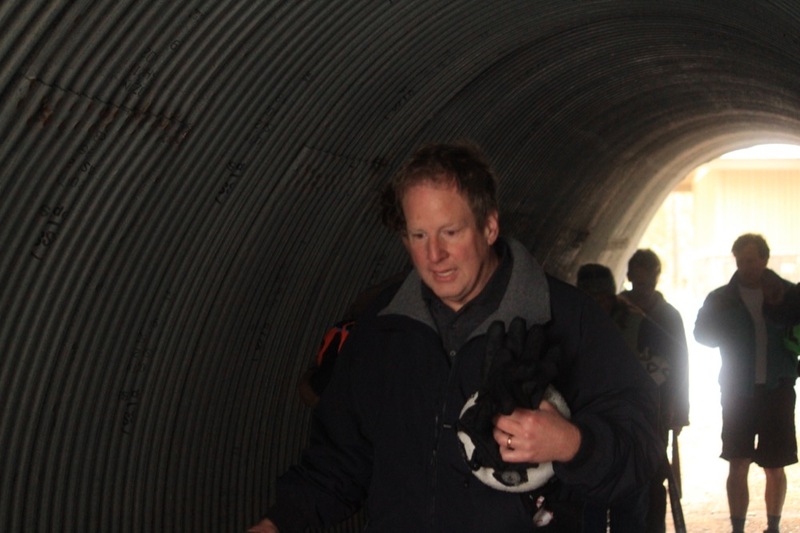 The treacherous course included unexplainably bumpy terrain, semi-frozen ponds and unmarked paths. 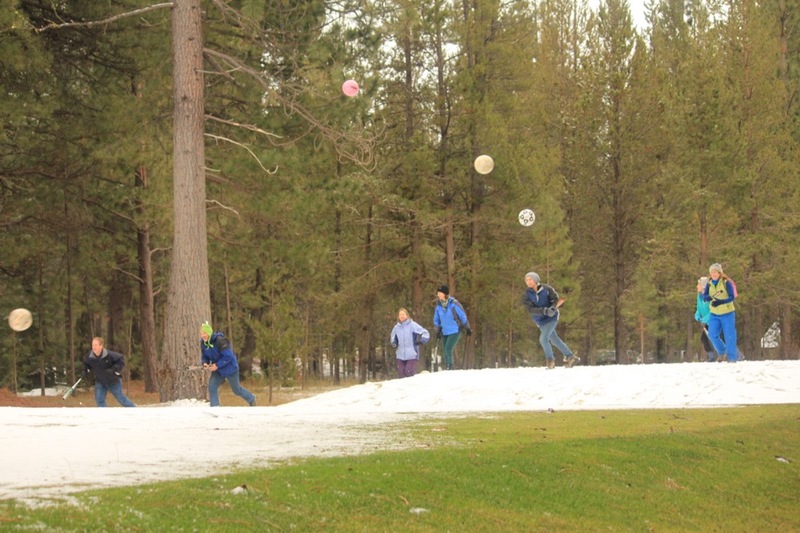 Thankfully no one was lost in this epic match. 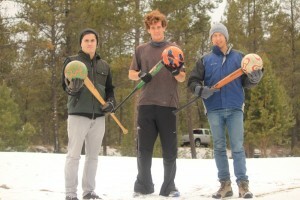 In the first round, Jeff took the lead and Stephen and Danny took 2nd and 3rd place. 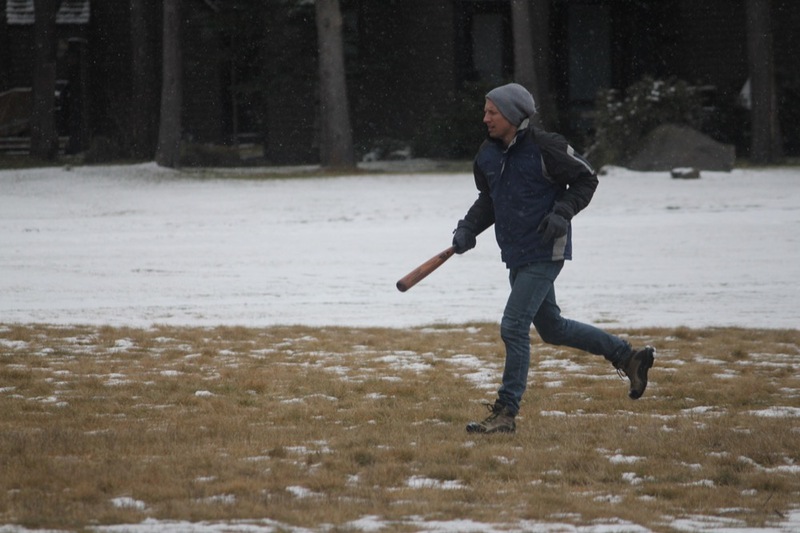 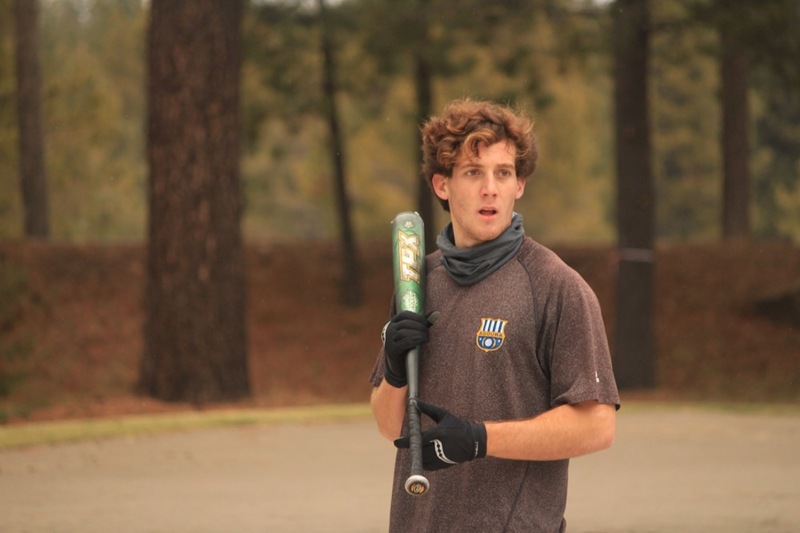 Danny’s performance was most impressive because he was caught on the ice, got hit by a ball, and slipped and fell three times. 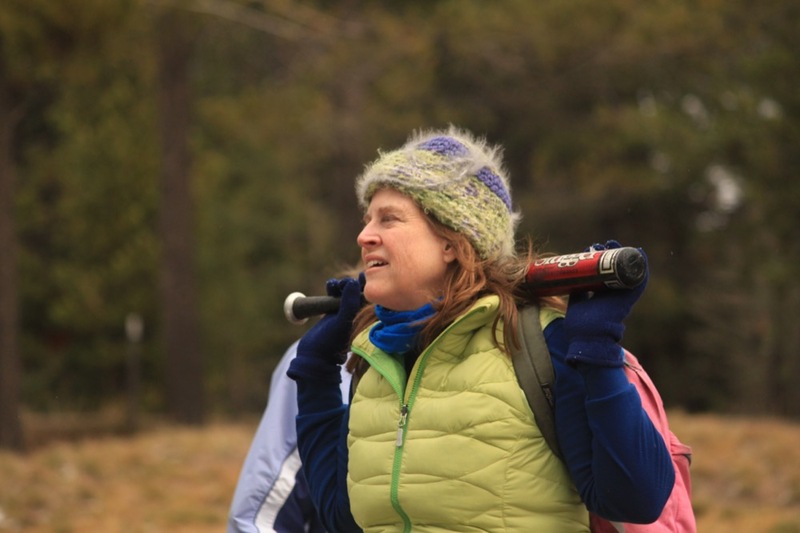 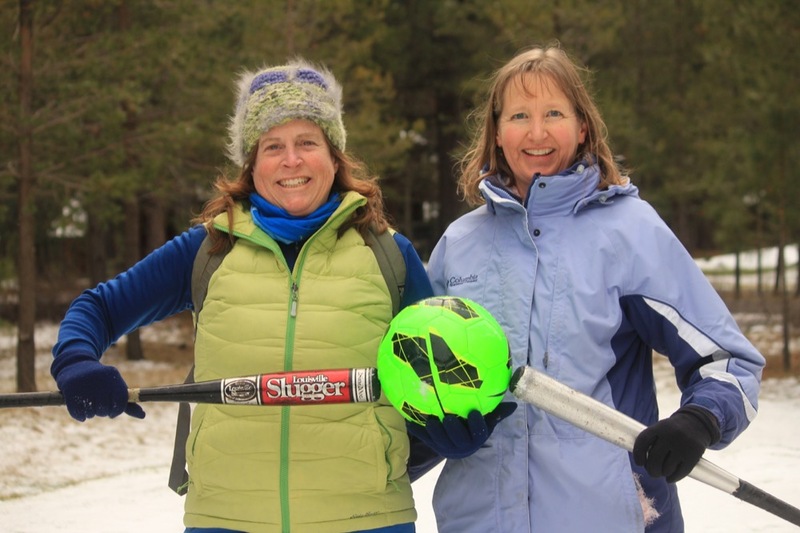 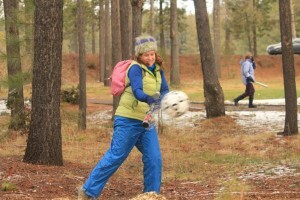 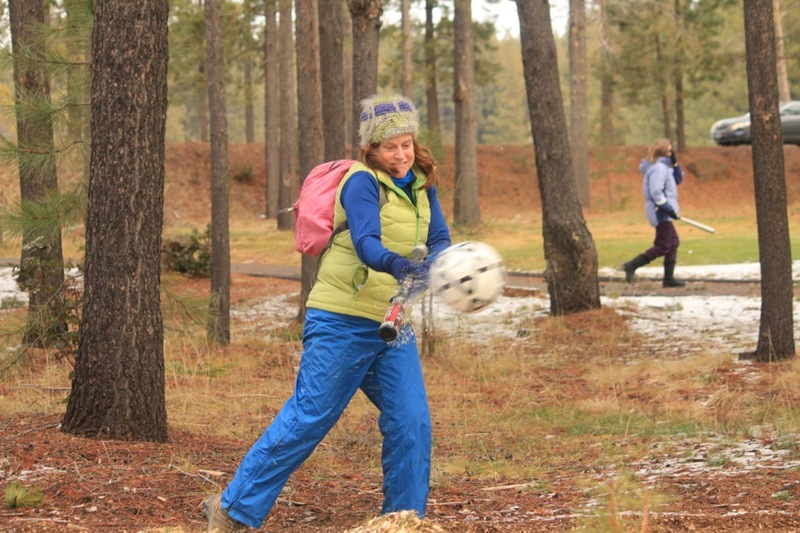 Anita Sheridan Price, who was in her 40’s at the time, bravely crawled out onto the ice to retrieve her ball. 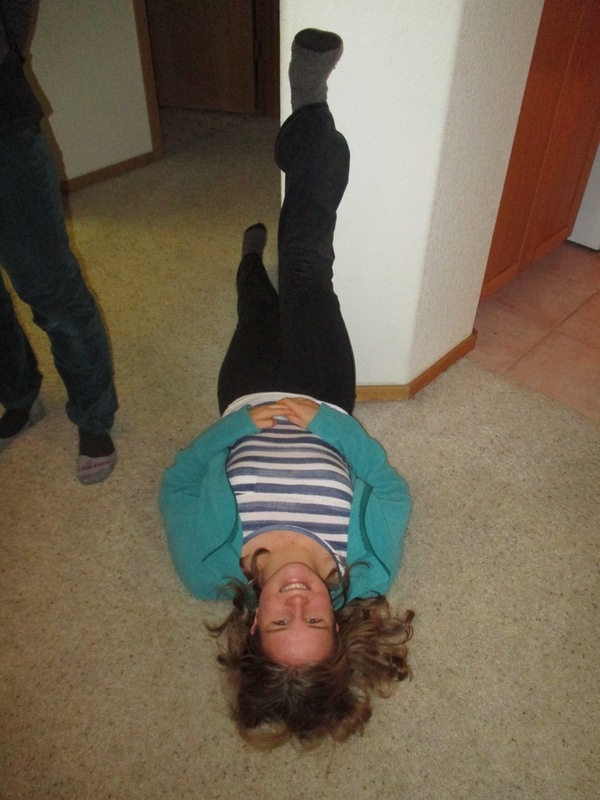 Miranda Who Wore Sweet Boots provided moral support. 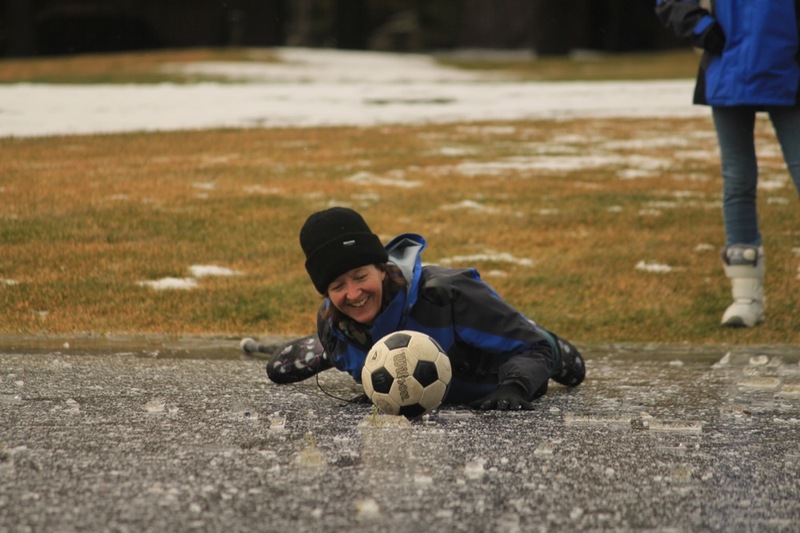 Anita Price crawls across the ice to retrieve her ball. 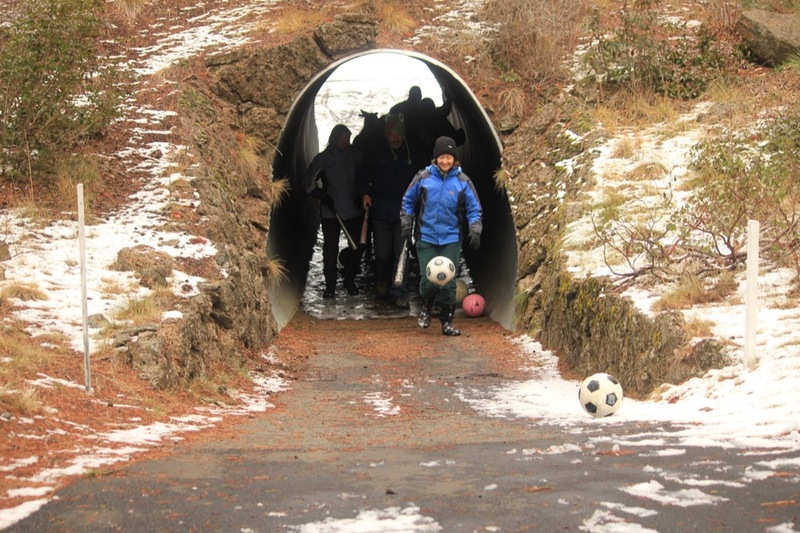 Round 2 required players to pass through a tunnel to the green on the other side of the road. 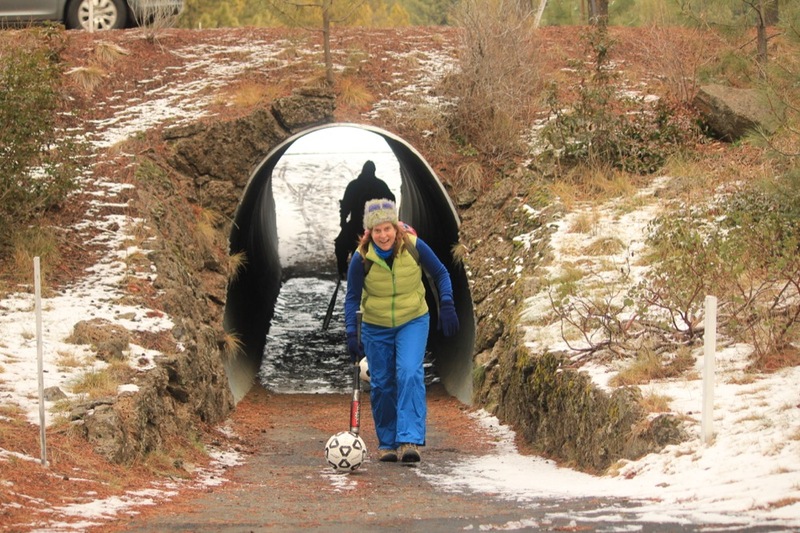 John Spielman, The Father of Cross Country Big Ball, adopted a literal interpretation of this rule and hit his ball over the road and then ran through the tunnel. 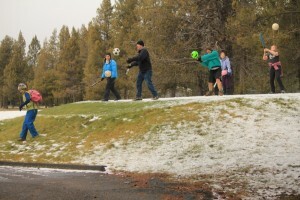 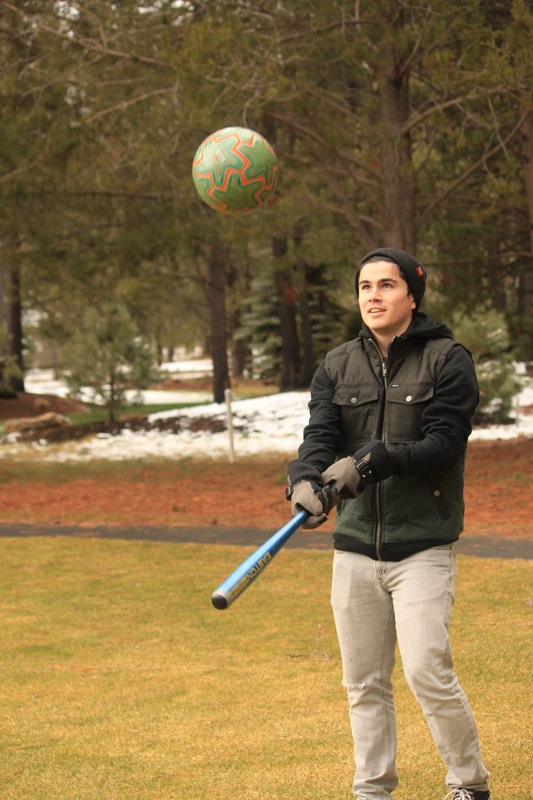 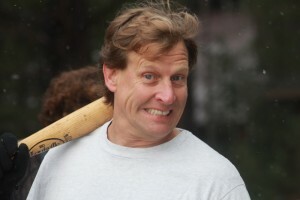 Unfortunately, the ball hit a car, as seen in the video below. 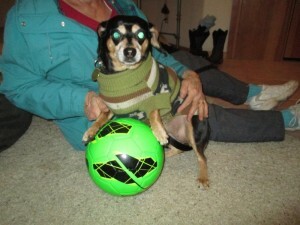 There was also much confusion regarding which green was the goal. 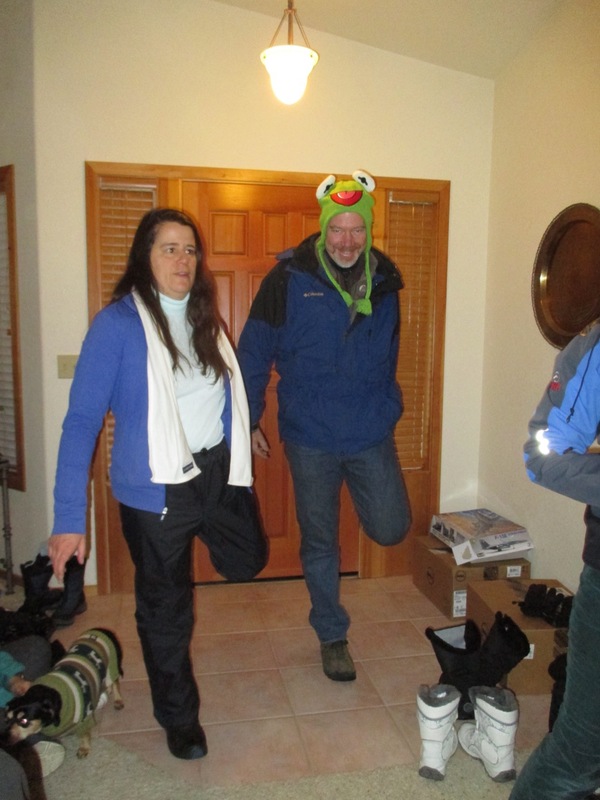 Kathy the Photographer told people to follow Pat the Kermit, but John cleared things up by declaring the other green to be the goal. 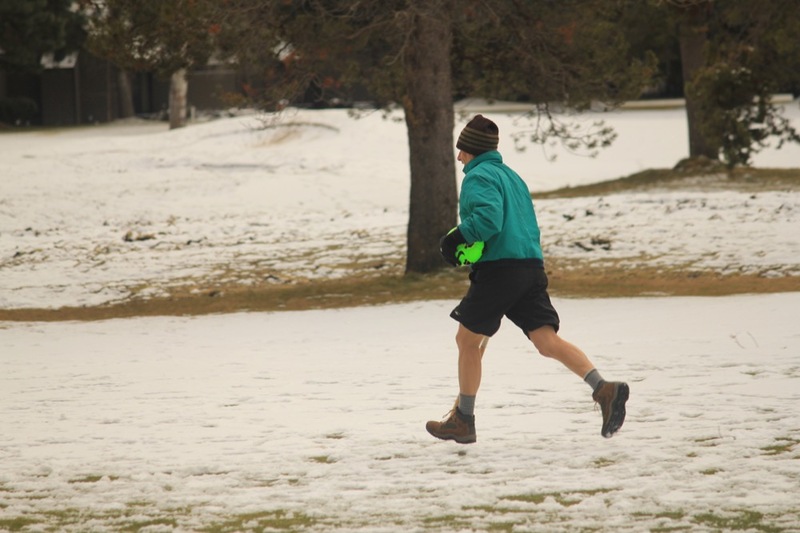 It’s not easy seeing green. 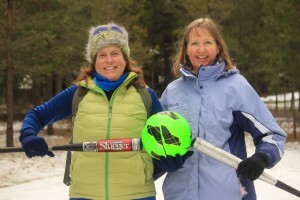 Kathy Spielman and Paula Sheridan were the Women’s Doubles Champions of Round 2, and Nolan and Pat “Kermit” Price were the Men’s Doubles Champions. Scott, John and Danny were singles champs, but somehow Jeffrey, Scott and Danny were pictured as champions while John recounted the game with Stephen Who Bats With One Hand. 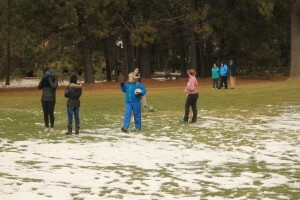 The intrepid athletes played two more rounds. Here is photographic proof that Jeff flies. 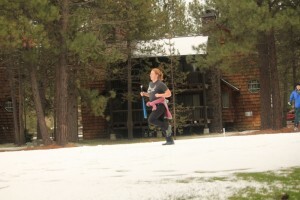 Sarah put together this great video from footage provided by Meredith. 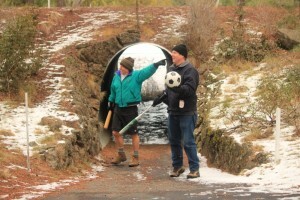 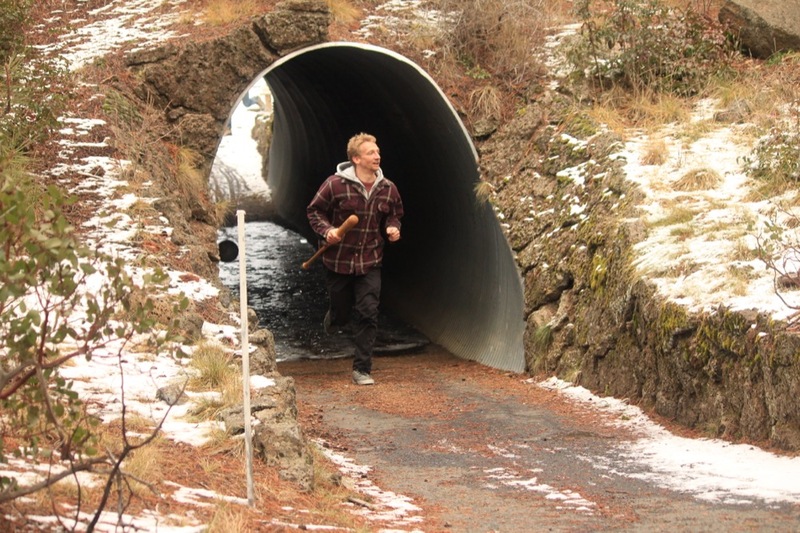 It includes the Frozopen and bonus footage of Benham Falls and The Really Snowy Day.